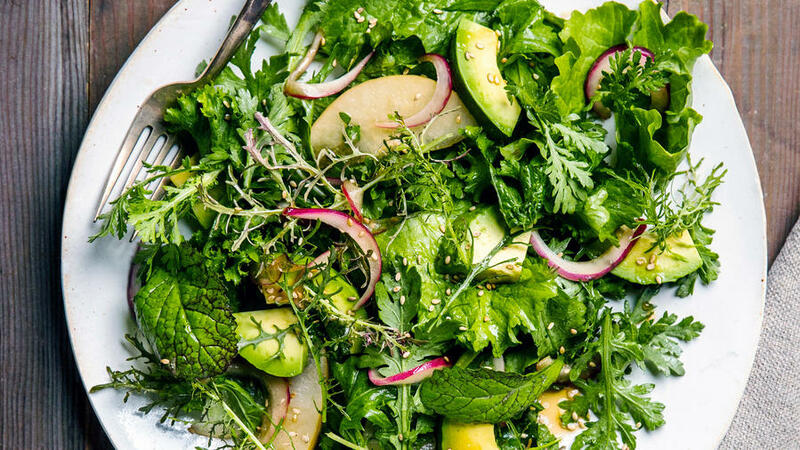 This might be our craziest salad yet (pickle dressing?) but when tasters came by the Sunset Test Kitchen, it disappeared in a flash. 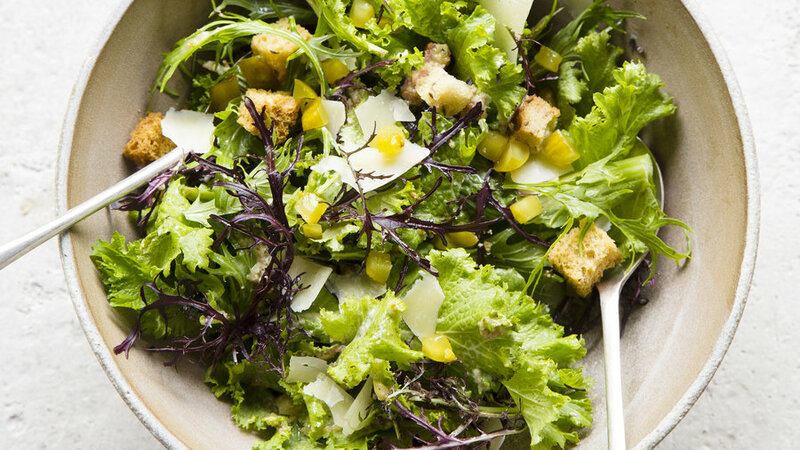 Here’s our favorite version of a basic side salad, with fresh herbs and the vinaigrette components in just the right proportions. You can serve it plain, or customize it with toasted nuts, croutons, or other add-ons. 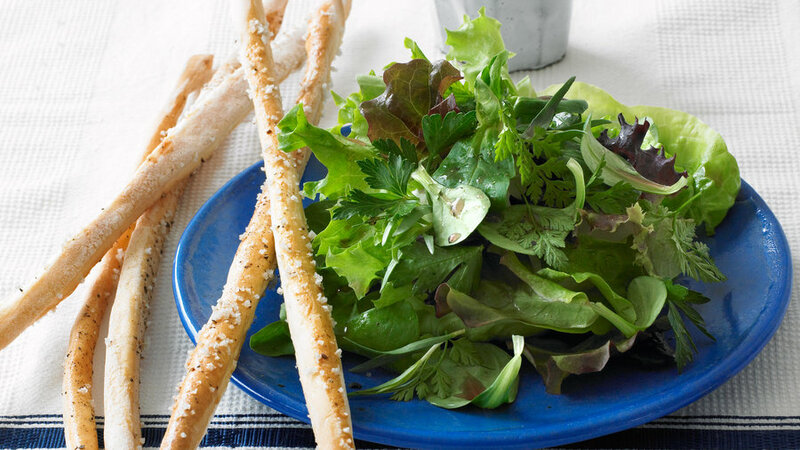 If you grow your own lettuces or buy them from the farmers’ market, show off a stunning assortment of small whole leaves in this platter salad. 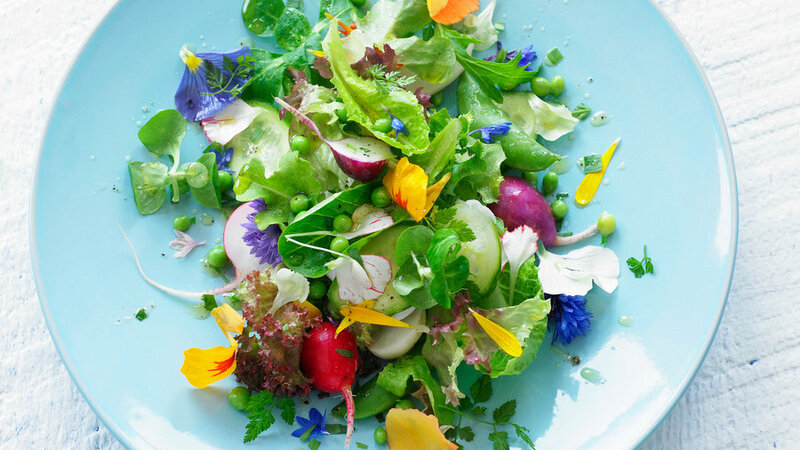 The colorful edible flowers, tender herbs and lettuces, and crunchy sugar snap peas for this pretty salad might all be growing in your garden, but if not, try a well-stocked grocery store or farmers’ market. 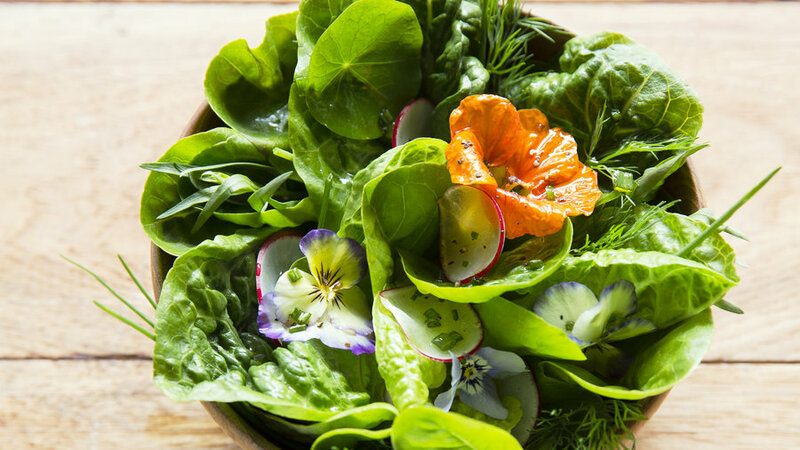 Express your inner artist and decorate whole, single-serving lettuces with herbs and edible flowers. 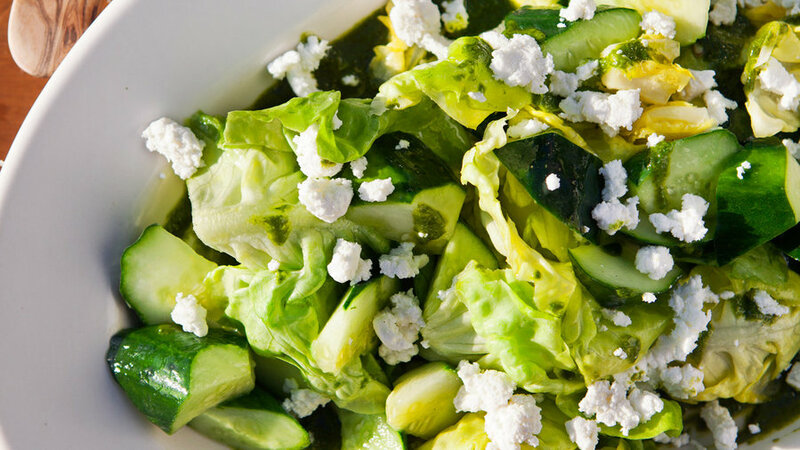 With a little chutney as the starting point for the dressing, it’s quick work to put together this summery salad. 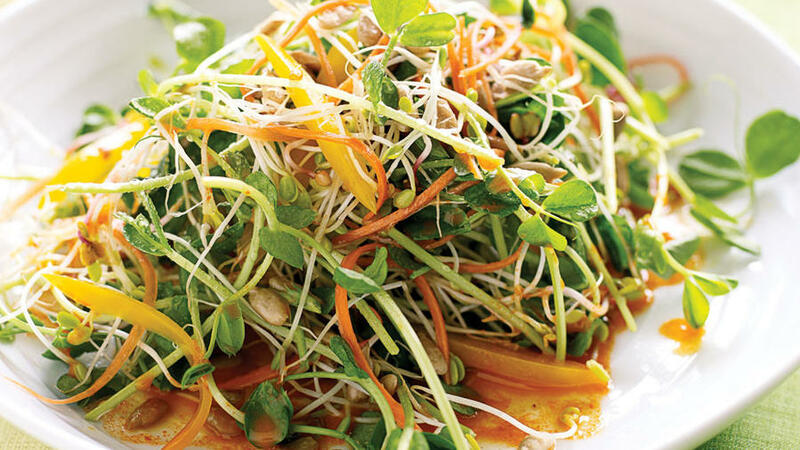 A Seattle chef shared this robust, addictive (and easy!) 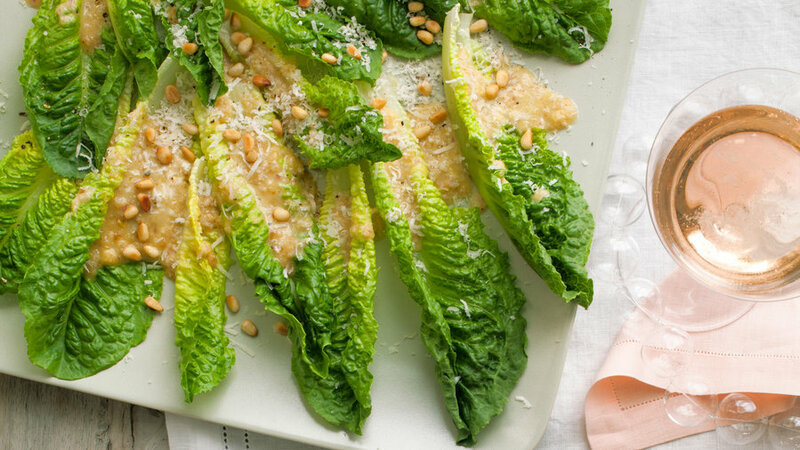 version of a Caesar. 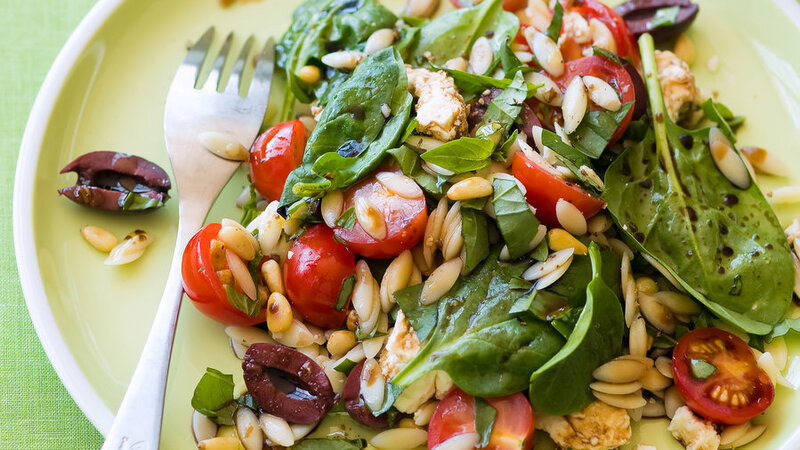 Briny olives and feta, plenty of fresh basil, and sweet cherry tomatoes give this spinach salad lots of personality. 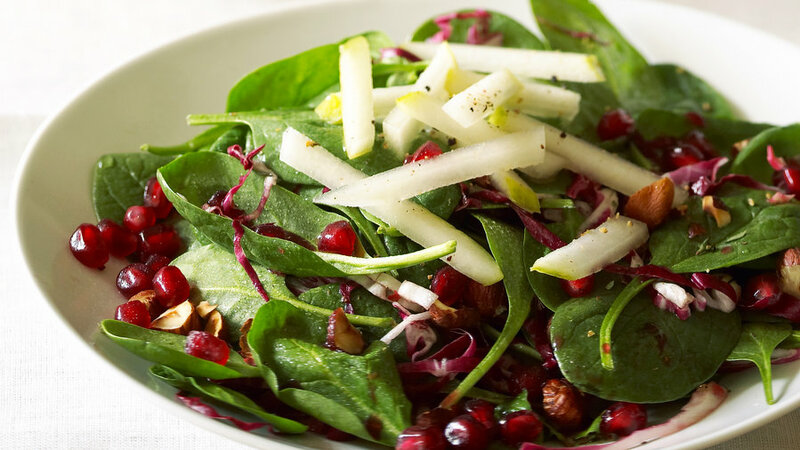 Roasted nuts add depth to the fall salad’s bright flavors, and crunchy pomegranates decorate it like jewels. 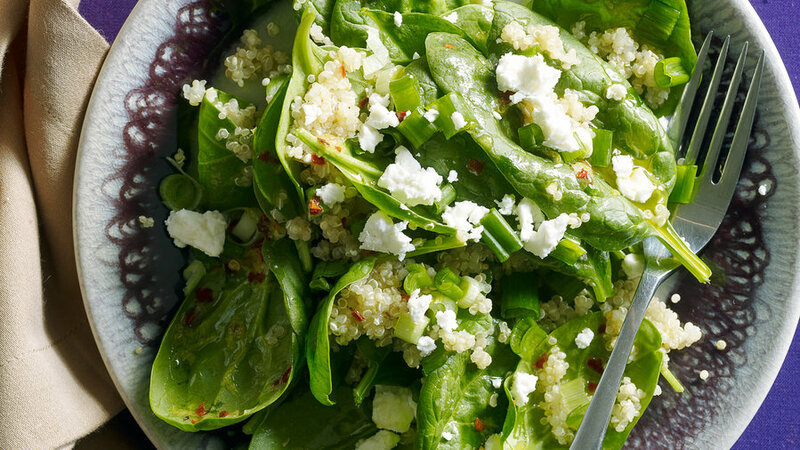 Quinoa and feta make this salad a little more substantial, and the lemon-chile dressing makes it lively. You may want to double the candied spiced nuts for this crowd-pleaser so you’ll have them on hand to make the salad again soon. 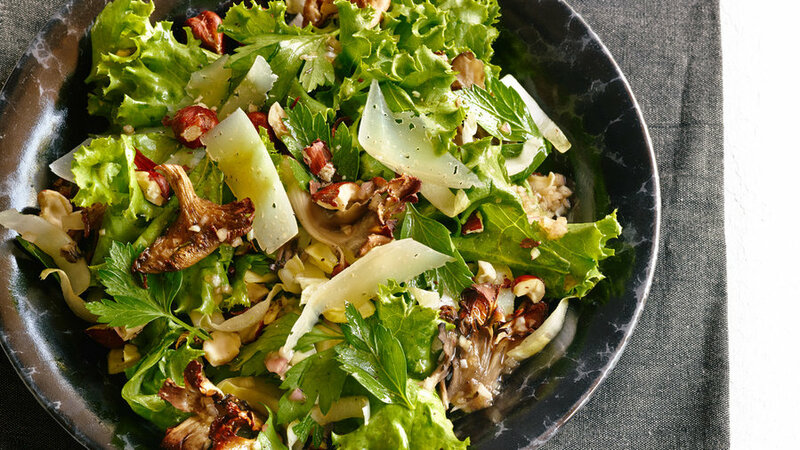 “My guests fought to have seconds and demanded the recipe,” said one reader about this mushroom-lover’s salad. 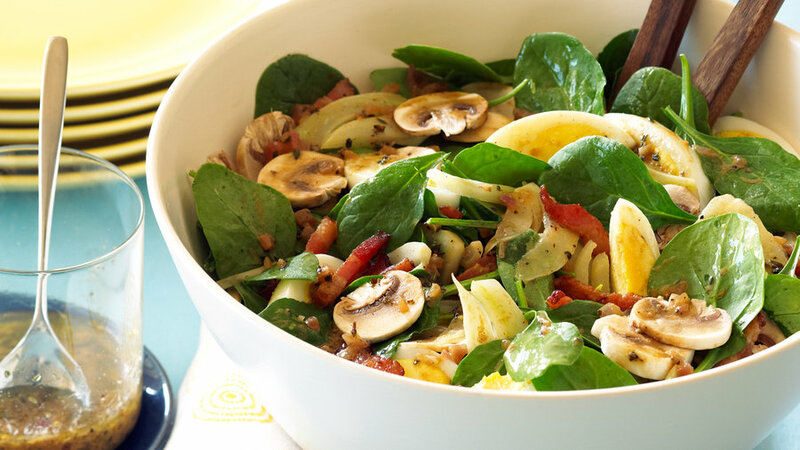 Loads of flavorful toppings, a Sherry vinaigrette, and of course bacon make this salad a keeper. 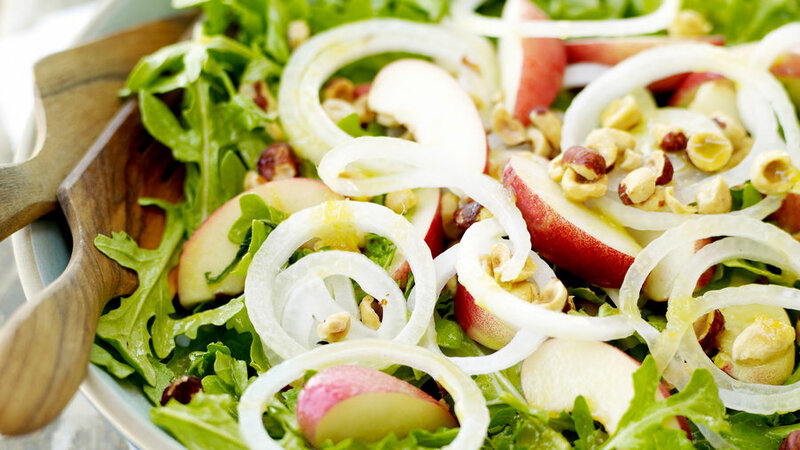 This easy platter salad doubles as an appetizer. 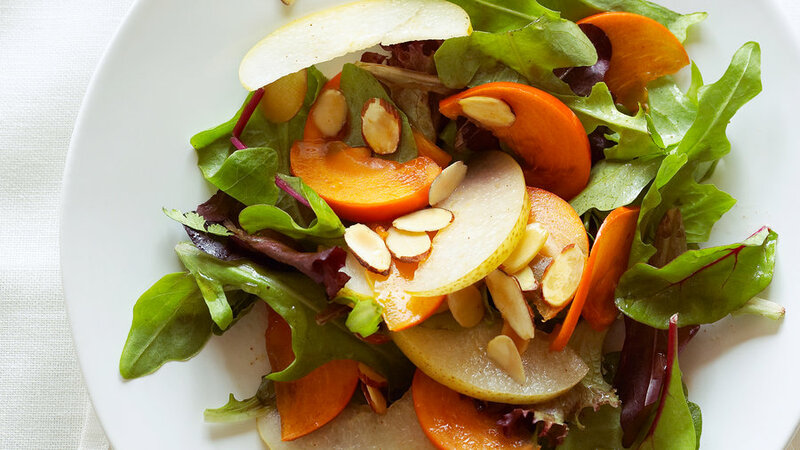 Sweet and slightly crisp Fuyus, the kind of persimmon with a flat bottom, star in one of our favorite autumn salads. 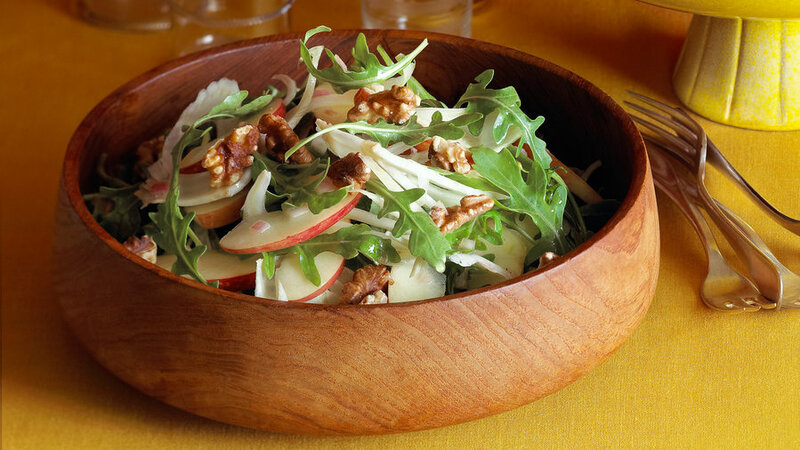 Apple juice and apple cider vinegar augment the flavor of sweet crunchy apples, and roasted walnut oil underscores the toasted nuts. A Sunset reader shared this addictive flavor combination. 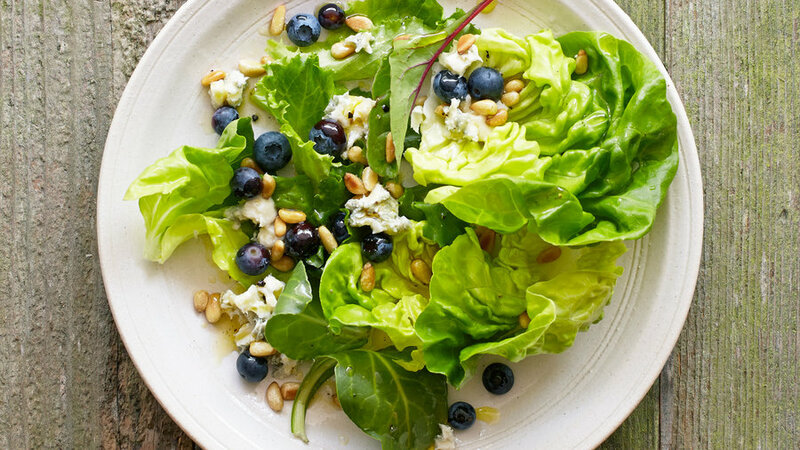 We first created this refreshing salad for Thanksgiving as a counterpoint to the big feast, but have come to love it anytime grapes are in season. 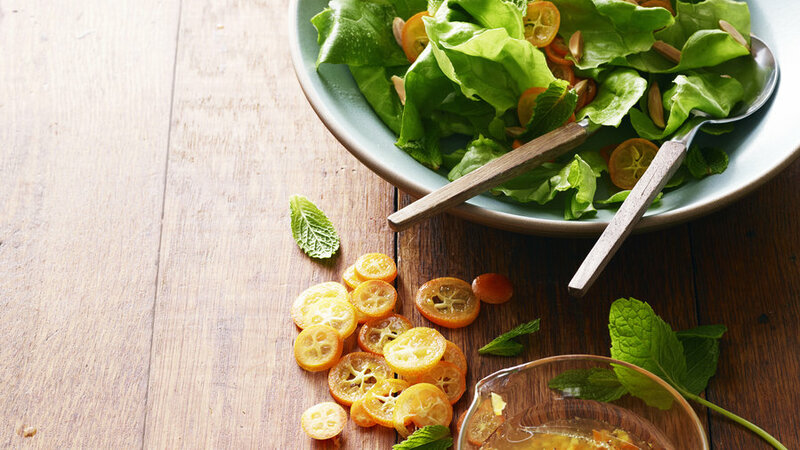 Though jasmine tea might seem unusual in a salad dressing, the floral quality has a beautiful affinity for citrus and mint. 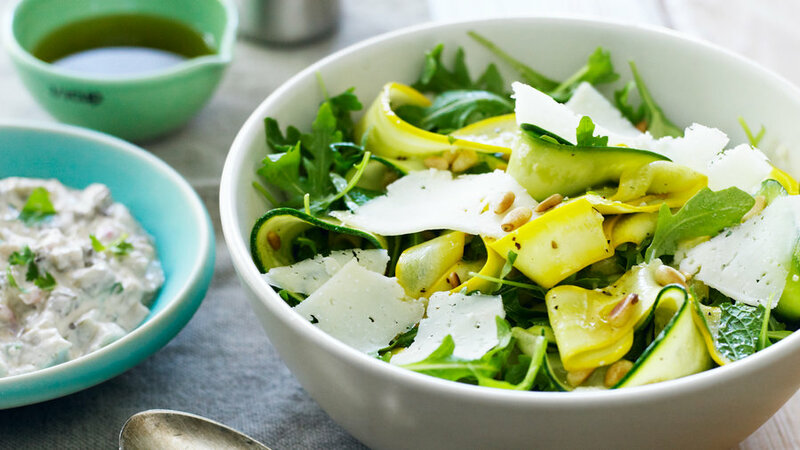 Finding ways to use zucchini can be a challenge in summer, but we find ourselves looking for excuses to keep making this lively and refreshing recipe. 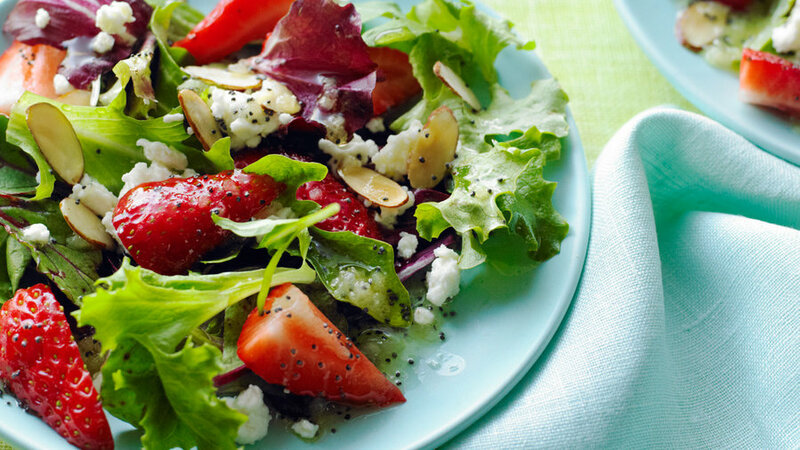 Feta cheese and a Champagne vinaigrette keep this fruit-and-greens salad from being too sweet. 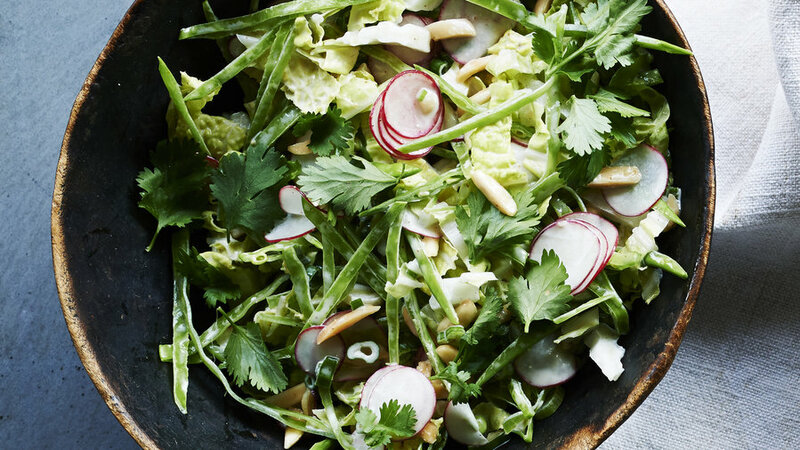 Add the creamy soy dressing just before serving so this fresher take on slaw keeps its texture. 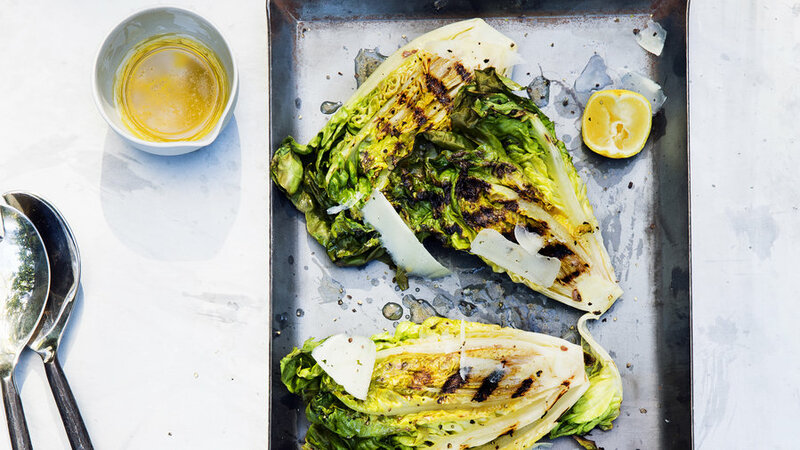 We took our Caesar outdoors and painted an eggless dressing onto small lettuce halves before grilling them. 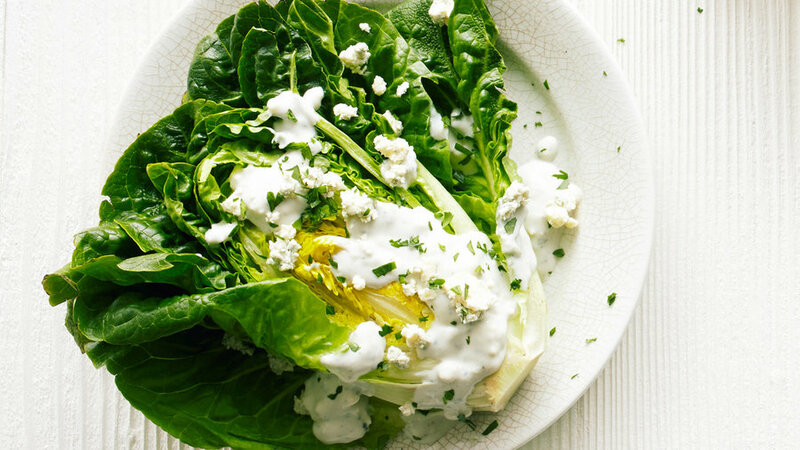 Many farmers’ markets now carry the small, crisp variety of romaine called Little Gem, but you can also spoon the homemade blue cheese dressing over regular hearts of romaine. 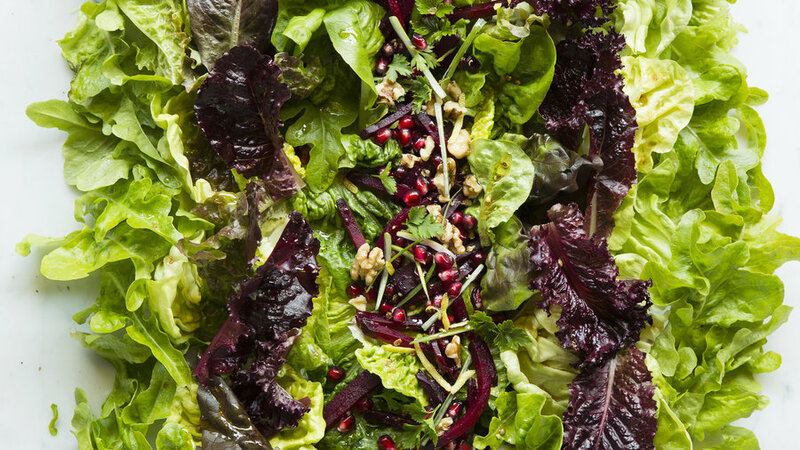 Try this beautiful salad platter next time you’re serving a crowd. 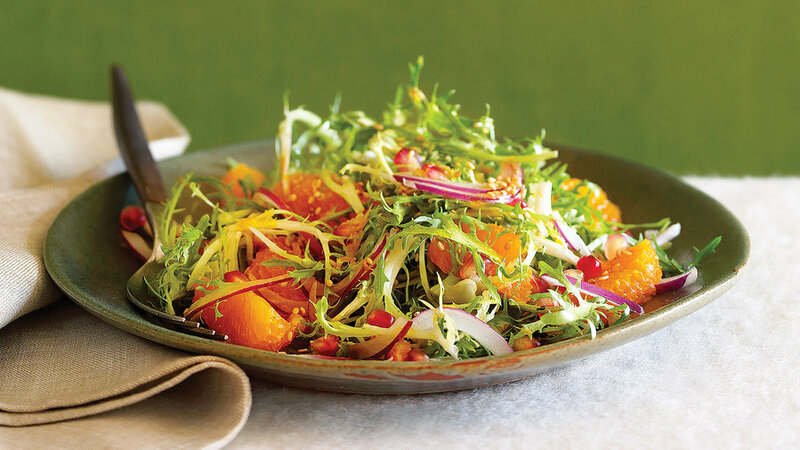 Tangerine zest, juice, and segments, along with sesame oil and crunchy seeds, deliver layers of flavor in this bright winter salad. 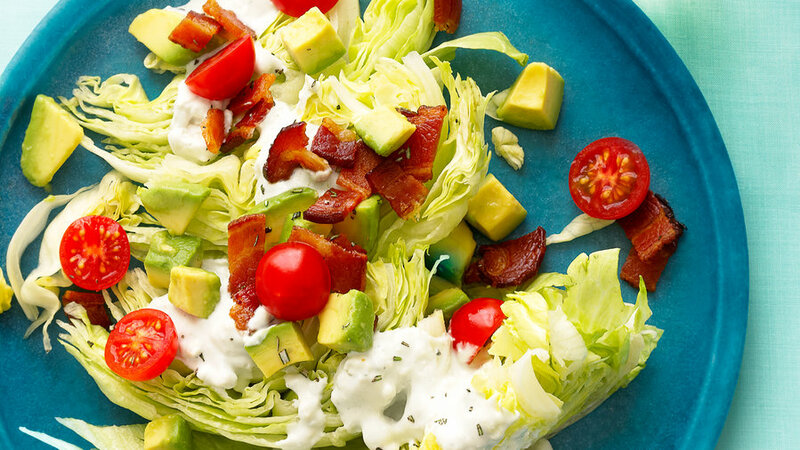 For this wedge salad we started with the classic flavor trio and added a creamy blue cheese dressing and herbs. 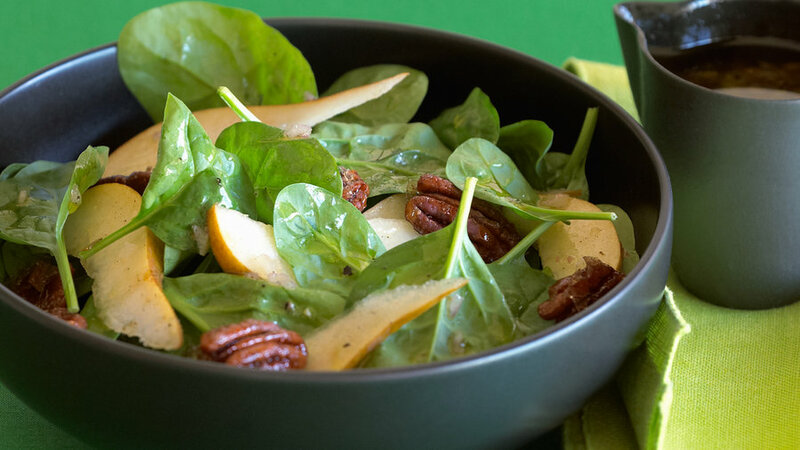 Contrast the feathery textures of baby Asian greens with the crunch of quick-pickled onion, Asian pear, and sesame seeds. 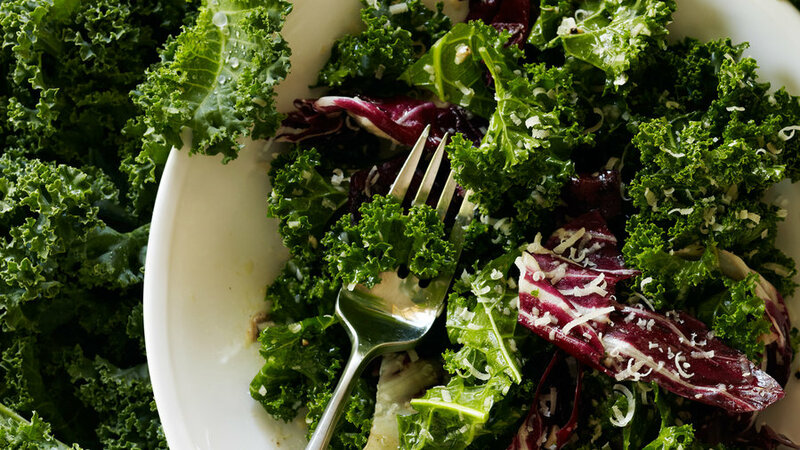 This salad is especially good made with the varieties at left, but feel free to experiment.